Tiger Woods may be one of the oddsmakers’ picks to emerge victorious Sunday at Augusta, but that just makes the four-time Masters winner’s colleagues chortle. The many pros Haney has spoken with don’t share gamblers’ optimism about Woods’ ability to capture that elusive 15th major at the men’s first grand slam event of the 2018 season. The reason for their naysaying, in addition to the obvious (he hasn’t won anywhere since 2013, he’s only five official tourneys into his recent return from a fourth back surgery)? Woods’ shaky driving. Woods, who ranks seventh on tour in strokes gained around the green so far in 2018, has clearly overcome the chipping yips that derailed his 2015 comeback. Woods’ putting, always a strength in his glory days, has come around as well, as his 14th in strokes gained putting indicates. Yes, Woods’ clubhead speed and distance are mighty impressive, especially for a golfer with a fused spine, and he has never been one to throw darts off the tee with the longest club in the bag. But the Big Cat has avoided using the big dog at times this year, going with a lot of irons. The good news for Woods is he has played enough rounds to qualify for the tour’s official stats. The bad news: he’s 202nd in driving accuracy, having found only about 52 percent (128 of 248) of fairways. 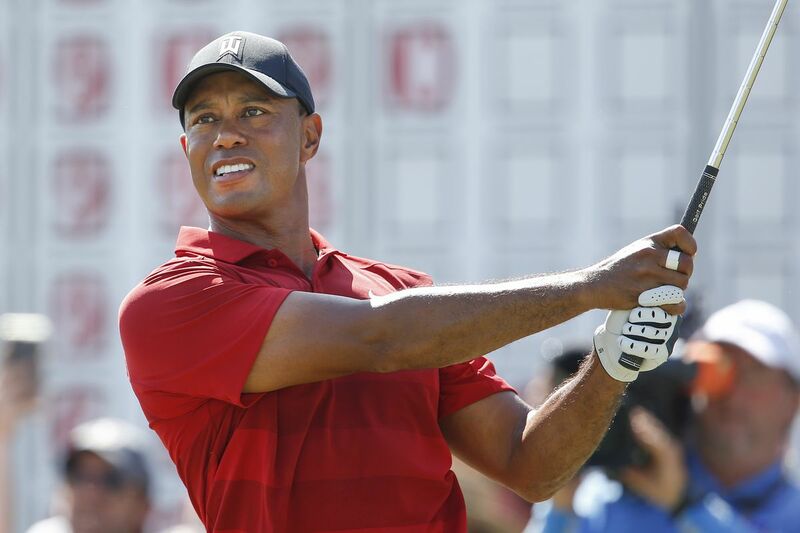 But for that out-of-bounds on the 16th hole at Bay Hill, Woods has made progress with the driver since his first tournament of the year at Torrey Pines, where he hit just 17 of 56 fairways and was tied for 76th in that category. He missed the cut at the Genesis Open, where he found 13 of 28 fairways, finished T45 off the tee (33 of 56) at the Honda Classic, and was tied for 16th at the Valspar Championship (31 of 52). He fell back to T66 after hitting just 34 of 56 fairways at Bay Hill, so it’s safe to say the driver is still suspect. And those he’ll be competing against come Thursday believe irons off the tee just won’t cut it at Augusta. The 575-yard, par-5 second sets up as “one of the easier drives for a lot of guys,” according to Rickie Fowler. Charl Schwartzel, who won the Masters in 2011, prefers driver to any tee position but the left on the 350-yard, par-4 third. Rory McIlroy wants to hit driver on the 510-yard, par-5 13th (Phil Mickelson’s “pine straw” hole in 2010), in the middle of Amen Corner, because an ice storm in 2014 thinned out the trees on the left. “If you take a little more risk off the tee and you pull it off you have a much easier second shot,” McIlroy told PGATour.com. Oh, and just to be clear, Haney has said he believes Woods will win again on tour, and, indeed, win a major. Woods’ opponents agree. Just not this major, and not this week.